Stunning vintage Great Gatsby style rhinestone choker bib swag necklace. This necklace comprises a double strand of immensely sparkly twisted rhinestone chain from which hangs a beautiful articulated pendant encrusted with round and marquise rhinestones. 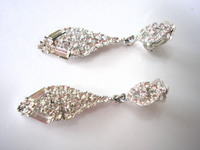 The stones are claw set in silver tone metal. The necklace measures approximately just under 16 inches (40cms) in length. The central pendant measures approximately 3 inches (7.5cms) in length and just over 1 inch (2.5cms) in width at it's widest part. The necklace is secured by a push in box clasp. This piece is in very good vintage condition, with minimal clouding to the stones. 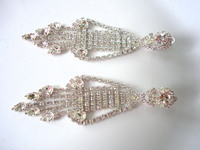 This wonderful piece would make the perfect accessory to your specially chosen Great Gatsby or Art Deco bridal gown. It would also be great for your prom night.